← Aim At The Players! A few weeks ago was the PinkAid/Ralph Lauren fashion show at Mitchell’s in Westport, CT where, in addition to professional models, 20 fabulous Breast Cancer survivors, ranging from 2 to 20 years survived, walked the runway strutting their stuff in support of Breast Cancer Awareness Month. I was honoured to be asked to walk and represent the newest of survivors and ended up being the first one out! 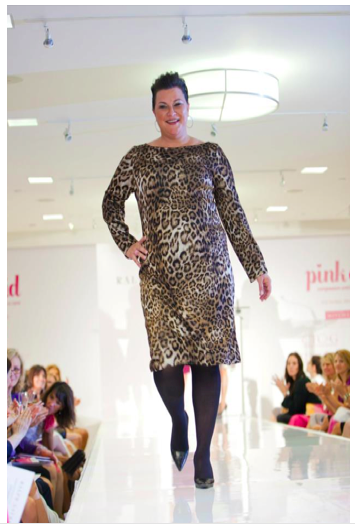 I wore this fabulous Leopard Dress by St John collection. When they styled me, I deliberately asked to be made up like PINK would if she walked down! Hoda Kotb spoke about her experience during diagnosis and treatment. My favourite line was when she said her Doctor asked ‘Exactly how attached are you to your Breasts?’ and her response was ‘Well, how attached are you to your balls?’. I think when you reach a certain age and stage of your life, there’s nothing like a little honesty to keep it real! This entry was posted in ALL POSTS, Heroes In My Book, The Big Events and tagged Breast Cancer Hoda Kotb, Hoda Kotb 2012, Pink Aid, Pink Aid Hoda Kotb. Bookmark the permalink.